Did you know that Thai Massage and western massage use two totally different approaches? It’s the anatomical and the energy line model. 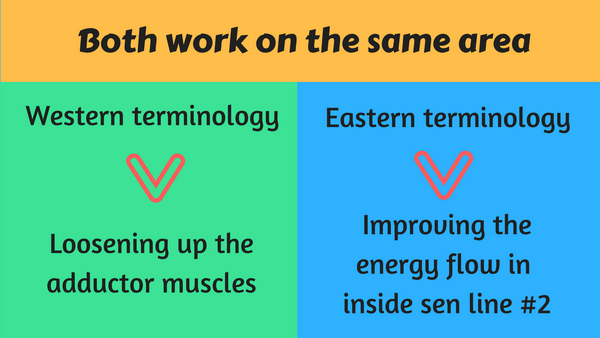 Without understanding this fundamental difference, you will miss the essence of Thai Massage. I’ve been living in Thailand for many years. That’s why I can look at this question from both the western and the eastern angle. 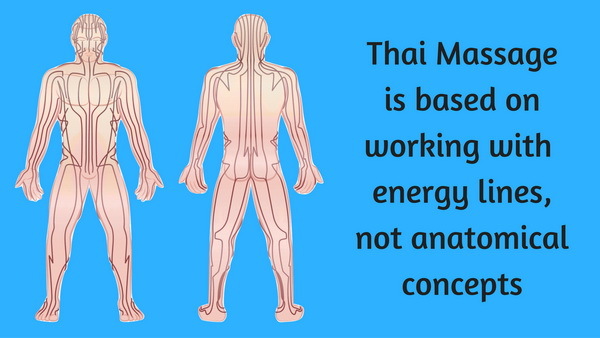 Do Thai Massage therapists need to know anatomy? One answer is NO – IF you are in Thailand. Here there are tens of thousands of Thai Massage therapists, and many can do excellent work, BUT practically none of them know anything about anatomy and physiology. I still remember, when I started out with Thai Massage back in 1999, I studied in a bunch of different schools, and not one of them mentioned anything about anatomy and physiology. Now you might think that they are basically all ignorant and uneducated here in Thailand. That’s not the case. The reason is that Thai Massage, and pretty much all eastern healing arts, are not based on the western scientific anatomical model. They are based on the energy line model. In other words, the purpose of Thai Massage is to improve and correct energy flow in the body. Let me give you a practical example. Let’s talk about the inner or medial thigh. If you ask western therapists what they are working on, they will say that they are working on the thigh adductor muscles. If you ask Thai Massage therapists the same question, they will say that they are working on the inside sen line number two. Both are touching the exact same area, but they use totally different terminology to describe it, and they have a totally different purpose. Western therapists will say that they loosen up the adductor muscles, and eastern therapists will say that they are improving the energy flow in the inside sen line number two. The eastern therapist doesn’t care what the name of the muscle is as long as she is on the sen line. The western therapist has no clue about the sen lines and is strictly focused on the muscle. Thai Massage has been practiced for hundreds of years in this way (the sen line system). However in the last 20 years or so Thai Massage has become popular all over the world, and as a result things are changing. Now let’s move outside of Thailand and let’s ask the same question again: Do Thai Massage therapists need to know anatomy and physiology? And now the answer is YES. Why? Because in the western world, if you want to get a massage license, you need to know anatomy and physiology. This is the only reference point which almost all western therapists have. It’s their language, their terminology. Is it really necessary for learning Thai Massage? No! Is it helpful? Yes! Nowadays there is kind of a hybrid system. Even here in Thailand the large Thai Massage schools have included anatomy courses into their curriculum in the last few years because their western students expect it and want it. But still, the vast majority of Thai Massage schools in Thailand only teach the sen line system without any anatomy. However with this hybrid system there is a potential conflict or a danger zone. Let me tell you what I mean. 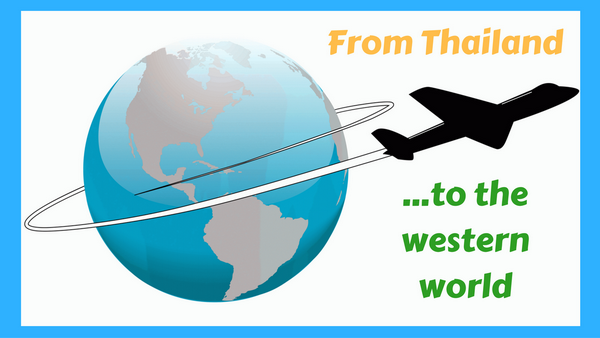 Many western therapists and massage schools try to convert or squeeze Thai Massage into the western massage model, the western mindset. Then Thai Massage becomes just a mechanical sequence of stretches and moves, but the essence is not there anymore. It’s similar to what happened with yoga in the western world. 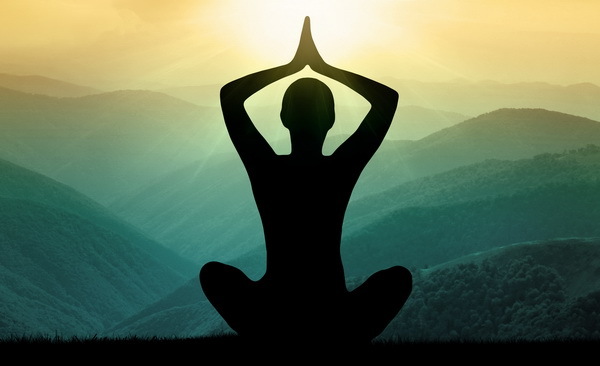 Yoga in India has traditionally been a spiritual discipline with the aim of raising your consciousness. But nowadays in the western world it is often practiced as just an exercise routine. It might look like yoga, but the original spirit and purpose is just not there. The same thing can happen with Thai Massage. If you squeeze Thai Massage into a western model which is only based on anatomy and physiology, then the consequence can be that you lose the essence of it. The beautiful thing about Thai Massage is that it has a strong cultural element. It can be a wonderful, connected, flowing, healing, artistic experience. It can raise the practitioner’s consciousness and turn you into a caring, sensitive healing artist. 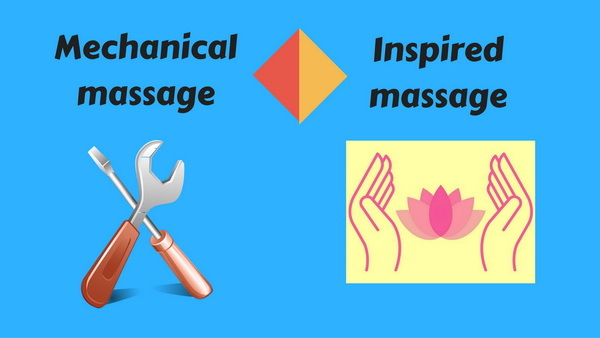 However if you learn Thai Massage as nothing more than a mechanical sequence of moves, even if you know exactly which bone or tendon or muscle you are working on, then it might look like Thai Massage, but it is just an empty shell. The essence, the spirit, is not there. So how do we bridge those two worlds? It’s not realistic for western therapists to disregard anatomy and physiology, and it’s not necessary. To me anatomy and physiology are very interesting and useful elements in Thai Massage. Here is the secret, and that’s what I am trying to do in my training courses. You can use the anatomy as a point of reference, as a communication tool that westerners can understand and relate to, kind of like a road map to the body. Then you are fine as long as you understand that there is more to Thai Massage than stretch here, yank there, pull here, press there. 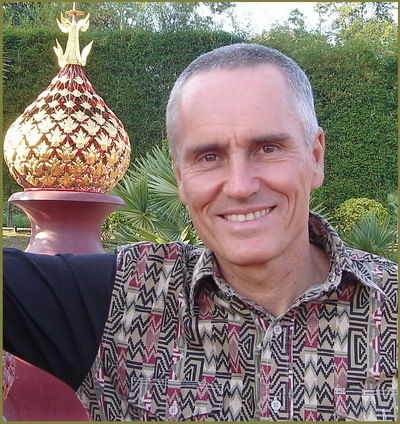 You can work in the spirit of Thai Massage and use the anatomy as an additional tool. The problem occurs if you look at Thai Massage only through the lens of a western scientific mindset. Then you are trying to squeeze a square peg into a round hole, as the saying goes. That will kill the spirit of Thai Massage and you are left with just the mechanical elements. Nowadays there are western therapists who have combined Thai Massage with other methods like trigger point therapy or Shiatsu or physical therapy. Some have integrated it with yoga to such an extent that it looks more like partner yoga. And some have turned it into a western system which is all based on anatomy. And then there are others who have converted it to a table style and abandoned the traditional floor mat style of working. Thai Massage in the western world has branched out in many ways. So there is a fine line between using the anatomy as a tool and throwing out the baby with the bath water by demanding that Thai Massage should conform to a western model. In my training courses I do use anatomical references, but when I teach the techniques, my main focus is on teaching students how to develop sensitivity, feeling, excellent ergonomics, a wonderful touch, a sense of flow and the ability to really connect with a client. In my experience this is what will graduate you from a “massage mechanic” to a healing artist. That’s what will make Thai Massage an amazing, fulfilling experience for you. It will also preserve your health and longevity as a therapist and it will make it a joy to practice. Thank you for this perspective, Shama. It is very affirming for me.. I am also medically trained for 10 years as an x-ray technician. I have instinctually known I am gifted with healer spirit. I had Thai massage and Yin Yoga instruction for a year from a Master. I never felt anything better for my body. Now I am in training and working on Thai massage clients. I have found the very things you discuss. I use my knowledge of anatomy for reference, but do the work from mainly intuition of energy flow. So we are kindred spirits. That’s exactly how I work as well. Thank you Shama Kern for this information! May I use this in a newsletter I am creating for a small pilates/massage studio? I would share this information giving you full credit for all information. I’d be happy to send you the segment!